This was a very delightful book that kept me thoroughly entertained. Story is a great character who is determined to get to the bottom of this mystery at any cost. This book was filled with some quirky characters, like PP Patti. Sometimes I had to chuckle at the antics of Story and all her wonderful cohorts. The setting for this series is also great. It is a place that I would like to visit. I really liked this cozy because it kept me guessing. The killer wasn't revealed till the very end. I won't give anymore away. I just say, pick up a copy of this wonderful book when it comes out this Tuesday, February 4, you won't be disappointed. I absolutely loved this book. It had me hooked from the time I picked it up, till I put it down. Mary Marks did a remarkable job with this cozy mystery. I liked the friendship between Martha, Birdie, and Lucy, I would love to have two friends like that. I was kept guessing till the very end, and there were so many twists and turns, it was impossible to figure out who the killer was and why. But Martha not only uncovers the killer, she uncovers a lot of nasty secrets, family and otherwise. Pick up a copy of this book, you won't regret it. Especially if you love quilts and mysteries. Thanks, Mary, I can't wait for the next Quilting Mystery. Mary Marks grew up in Los Angeles and the San Francisco Bay Area. She became an award winning quilter after retiring from an administrative job at UCLA. 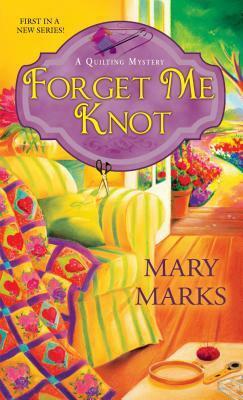 Her first quilting mystery, Forget Me Knot, was a finalist in the 2011 Malice Domestic competition. "I always heard that the best stories come from writing what you know, so Martha Rose is loosely modeled after me: a divorced, overweight Jewish quilter of a certain age who lives in the San Fernando Valley." The smart but impulsive Martha Rose is aided and abetted by her best friends Lucy and Birdie and a cast of quirky characters. The author is an unrepentant Hidden Object game player and Sudoku addict. "Solving puzzles, finding patterns, piecing things together--that's what quilters and mystery writers do all the time," says the author. About the book: She found peace in a time of war. Desperate to save her dying mother, an American woman accepts her newspaper's assignment to travel to Italy where she takes photographs dangerously close to the front lines during World War II. But Rachel's real motive in this journey is to find the father she never knew, an artist she hopes can offer the comfort and support both she and her mother need to survive at such a desperate time. In her quest, Rachel becomes involved with what will become the Monuments Men effort to save great monuments and works of art from the Third Reich. Soon enough she will find more than she ever imagined---in war, in love, and in God. I like to read about the era of World War II, but unfortunately, I didn't care for this book that much; although, I did learn about something I knew nothing about. The writing was really good and I got a really good sense of what WWII was like. Cara did her homework, but I just couldn't connect with this story or it's characters, they felt distant to me. I guess maybe if I liked art and knew a little more about it, I would have enjoyed this story better. If you enjoy art and the artistic history of Italy, and also enjoy WWII, then this would be a good book for you to read. I really hate that I didn't enjoy this book, but that happens sometimes. Good job anyway, Cara, this is a great effort to tell a story of something from WWII that most people, me included, knew nothing about. About the author: Cara C. Putman graduated high school at 16, college at 20, and completed her law degree at 27. The best-selling author of more than a dozen books, Cara is active in women's ministry at her church, teaches graduate courses at Purdue University, practices law, and is a homeschooling mom. She lives with her husband and 4 children in Indiana. 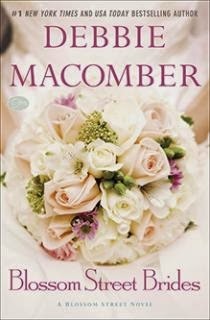 #1 New York Times bestselling author Debbie Macomber has won the hearts of millions of readers with her moving and inspiring stories. Now wedding bells are ringing in the tight-knit community that gathers around A Good Yarn, a store in a pretty Seattle neighborhood. Knitters come to the store to buy yarn and patterns but somehow they leave richer in friendship and love. This wasn't my first visit to Blossom Street, although it has been a while and I haven't read all of the Blossom Street books. This was classic Debbie. She has a way of writing that makes you feel like you actually know the characters and you feel the same pain and joy they are feeling. I like the community feel of Debbie's books. This book was no different. This book gave glimpses into the lives a several different people and families. Debbie also does really well portraying real life struggles. I always enjoy Debbie's books, and this one was no exception. This was a fast read because it flowed so well and was so enjoyable, sometimes I couldn't put it down. Great job as always, Debbie. 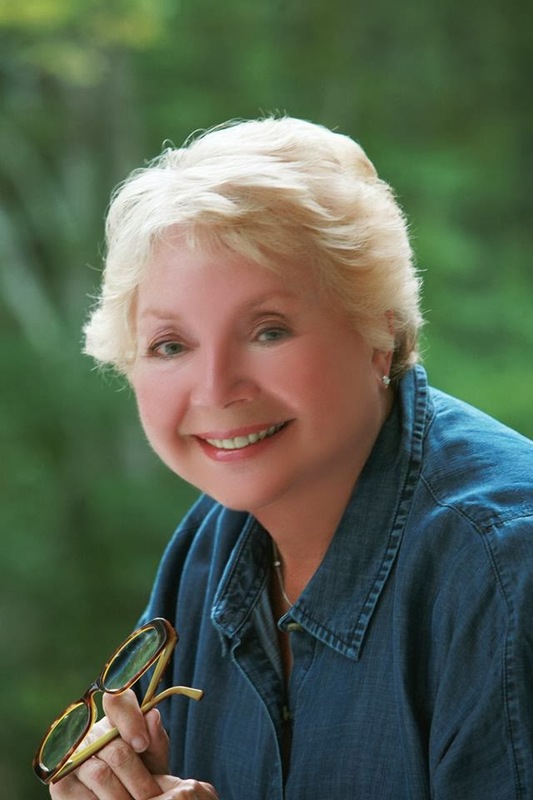 Macomber is the author of more than 100 novels, most recently Starry Night and Rose Harbor in Bloom; two bestselling cookbooks; numerous inspirational and nonfiction works; two acclaimed children’s books and the Mrs. Miracle Christmas novels. She is also the author of beloved and bestselling Cedar Cove Series set in Cedar Cove, Washington, on which Debbie Macomber's Cedar Cove, Hallmark Channel’s first dramatic scripted television series, is based. She is the recipient of a RITA® award; an RT Book Reviews Lifetime Achievement Award, and is a multiple winner of both the Holt Medallion and the B. Dalton Award. In 2010, the Romance Writers of America presented Macomber with their prestigious Nora Roberts Lifetime Achievement Award. Her next novel to be published will be BLOSSOM STREET BRIDES (April 2014). 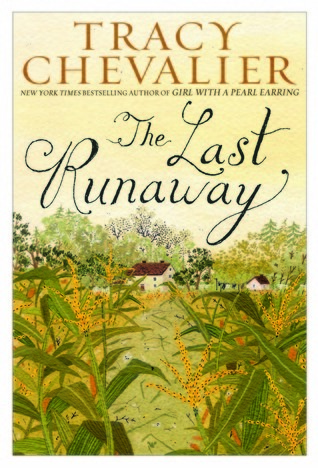 New York Times bestselling author of Girl With a Pearl Earring Tracy Chevalier makes her first fictional foray into the American past in The Last Runaway, bringing to life the Underground Railroad and illuminating the principles, passions and realities that fueled this extraordinary freedom movement. I really enjoyed this book. It was a fast read that kept my attention throughout the book. Honor became a stronger character as the story progresses. She has a lot of decisions to make. I also liked how the author portrayed the Quaker lifestyle. I didn't know a lot about that lifestyle before I read this book. Tracy did her research, that is for sure. I highly recommend this book. I read this book for the book club I recently joined, and I am glad that I did! I obtained a copy of this book from my local library and was not asked to do a review on it. This story started out a little slow for me, but towards the middle it really picked up and I didn't want to put it down. There is more going on in this book besides Amanda wedding Wyman and combining their families. There is also the love story of James and Abby that is playing out and how he can't find the right time to ask Abby to marry him. I felt that Naomi did a very good job portraying Amanda's dilemma. Amanda and her family have a very hard time fitting in at Wyman's home and in his district. But when tragedy strikes, will Wyman realize that God is directing him in a different direction. This book was very well written with realistic situations. It shows that even the Amish have marital problems. Very good job Naomi. I really enjoyed this book. Like my heroine, Miriam Lantz, of my Seasons of the Heart series, I love to feed people—to share my hearth and home. I bake bread and goodies and I love to try new recipes. I put up jars and jars of green beans, tomatoes, beets and other veggies every summer. All my adult life, I’ve been a deacon, a dedicated church musician and choir member, and we hosted a potluck group in our home for more than twenty years. Like Abby Lambright, heroine of my Home at Cedar Creek series, I consider it a personal mission to be a listener and a peacemaker—to heal broken hearts and wounded souls. Faith and family, farming and frugality matter to me: like Abby, I sew and enjoy fabric arts—I made my wedding dress and the one Mom wore, too, when I married into an Iowa farm family more than thirty-five years ago! When I’m not writing, I crochet and sew, and I love to travel. Inspired by the life of a 19th century woman rice planter, Carolina Gold continues Dorothy Love’s winning tradition of weaving together mystery, romance, and rich historical detail, bringing to life the story of one young woman’s struggle to restore her ruined world. This was a very interesting story. I enjoyed reading it. Charlotte was a very strong and determined character. In a time when women depended on men, she was independent and tried to make a go of her rice plantation. It was very well written and flowed really well; therefore, it didn't take me very long to read this book. It was filled with wonderful characters. I highly recommend this book. It gave a very good glimpse of what life was like during the restoration of the Old South, and during a yellow fever epidemic. It takes us from Charleston, to the Low Country of SC, to Pawley's Island, and finally to New Orleans. Great job, Dorothy. A former journalist, free-lance writer and college professor, Dorothy Love explores the intersection of history and human relationships to create novels that speak to the hearts of women everywhere. She is the author of the acclaimed Hickory Ridge novels set in her native state of Tennessee. 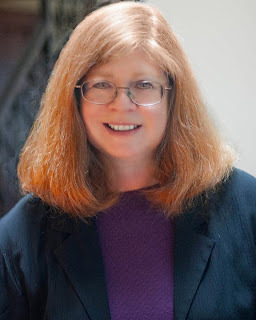 After earning a masters degree and Ph.D, she authored dozens of magazine articles before breaking into book publishing with a number of award-winning novels for preteens and young adults. The Hickory Ridge series marked her adult fiction debut. Currently she is working on several stand-alone historical novels set in the South. When she isn’t busy writing or researching her next book, Love enjoys hiking, traveling, and hanging out with her husband Ron and their rambunctious golden retriever. The Loves make their home in the Texas hill country. This series just keeps getting better and better, and I love how J. J. Cook leaves you hanging at the end of each story so that you absolutely cannot wait for the next book! I love Stella, she is such a strong character. I also like her relationship with Eric, who happens to be ghost! This book absolutely left me guessing and I had no idea in which direction it was going to go. I think there are still some answers to be found in Eric's death. I am anxiously awaiting the next book in this series, please hurry. Great job! 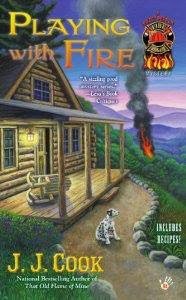 J.J. Cook’s first mystery, That Old Flame of Mine, became an instant bestseller in 2013. Playing with Fire is the second book in that series. 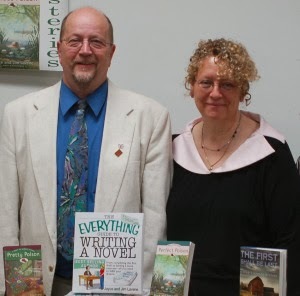 They write award-winning, bestselling mystery fiction as Joyce and Jim Lavene, and Ellie Grant. They have written and published more than 70 novels for Harlequin, Berkley, Amazon, and Gallery Books along with hundreds of non-fiction articles for national and regional publications. They live in rural North Carolina with their family. 1. Where did you get the idea for this series? We were on vacation in Tennessee three years ago, and watched a tiny volunteer firefighting group practicing in front of their station. Watching them, and feeling the exhilarating presence of the Smoky Mountains, made us want to write a story about the two. Everything else came after. 2. Do you believe in ghosts and if so, have you had any experiences with them? We both believe in ghosts, and have had experiences with them. We joined a group of ghost hunters for a while after having childhood experiences. How anyone can say that ghosts don’t exist is beyond us. Go out some night with one of these real-life groups, and they’ll make a believer out of you. 3. Who is the character, Stella, based on? Stella Griffin, our fire chief from Chicago, is actually based on Joyce’s great-grandmother who married the first firefighter in her family. She was pretty tough. This was around 1900, when the Chicago fire wagon was drawn by white horses. Her great-grandmother actually drove the wagon one day during an emergency – though it was vehemently denied afterward by the men. Women weren’t firefighters back then but not because they couldn’t handle the job. 4. Who is the character, Eric, based on? Eric is based on a friend of ours who we knew when we lived in Minnesota. He was a tough lumberjack with a big heart who died too young in a tragic accident. 5. Has either of you ever been a firefighter? Yes, Jim was a volunteer firefighter for many years. Joyce wanted to be a professional firefighter when she was a teen, but it was unthinkable at the time. She wanted to follow in the lives of her great-grandfather and grandfather plus uncles and cousins, but ended up writing about them instead. 6. How did you celebrate the Christmas and New Years holidays this past year? We celebrated with our family. We have day-long events for putting up Christmas trees in each other’s houses and traveling from house to house for Christmas Eve to open gifts and eat breakfast, lunch and dinner. On New Year’s Even we celebrate with fireworks and a huge bonfire that consumes the old trees. It’s a wondrous time of year! Our favorite time of year is from September to the end of December. It’s one amazing moment after another! Piper Prescott, a transplanted Yankee living in the South, has got her sass back. She might be down, but don’t count her out. “Change of life?” she asks. Bring it on. Recently divorced, Piper decides to pursue a dream she’s secretly harbored: owning her own business. Spice It Up!, a spice shop in her adopted hometown, Brandywine Creek, Georgia. But Piper’s grand opening goes awry when the local chef who’s agreed to do a cooking demo is found stabbed. Not only did Piper find the body, she handled the murder weapon and doesn’t have a witness to her alibi, making the case look like a slam dunk to brand new police Chief Wyatt McBride. Desperate to uncover the truth—and prove her innocence—Piper enlists the help of her outspoken BFF Reba Mae Johnson to help track down the real culprit. The pair compile a lengthy list of suspects and work to eliminate them using their own creative brand of sleuthing techniques including stakeouts, breaking and entering, and one very unorthodox chocolate pie. When Piper narrowly avoids being a victim of a hit-and-run, she knows she’s getting closer to the truth, but can she catch the killer and clear her name before she becomes the next victim? 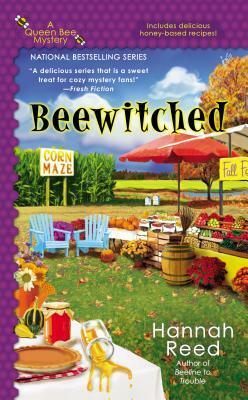 This was a great cozy mystery that kept me guessing till the very end. Piper is getting ready to open her spice shop, Spice It Up!, when she finds the chef she has scheduled for her opening dead. Piper h as to do a lot of digging to find the killer and clear her name. In the meantime, she has to deal with her ex-husband and her daughter, who gets into so trouble on Prom night. I really enjoyed this book, it was fast paced and kept me involved from the very beginning. Great job Gail, I look forward to more in this series. 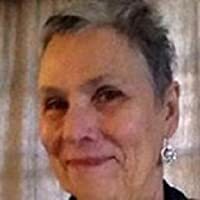 Gail Oust is often accused of flunking retirement. While working as a nurse/vascular technologist, she penned nine historical romances under the pseudonym of Elizabeth Turner. It wasn’t until she and her husband retired to South Carolina that inspiration struck for a mystery. Hearing the words “maybe it’s a dead body” while golfing fired her imagination for writing a cozy. Ever since then, she spends more time on a computer than at a golf course. Author of the Bunco Babe mysteries, she’s currently working on a new Spice Shop mystery series. I’ve heard some writers claim they wanted to write since they were children. They tell about writing their first book while still in grade school. Well, I have a confession to make. I’m a late bloomer. I didn’t begin writing until my children were in school and a certain birthday was rapidly approaching. But, as I say, better a late bloomer than a no bloomer. There weren’t many career choices for girls back when I graduated from high school--or at least not to my limited knowledge. No one I’d ever heard of in the small town where I grew up had aspirations of becoming a novelist. Or if they had, they kept their dreams to themselves and went about their daily lives working and raising their families. But one thing my town did have was a library. Years later, I can still recall the tantalizing musty smell of books and exactly the spot where I’d find Nancy Drew. I also devoured the Hardy Boys, Trixie Belden, and the Dana Girl mysteries. I loved them all. Little did I suspect that one day I’d be writing mysteries of my own featuring an amateur sleuth. While I harbored a vague someday-I’ll-write-a-book fantasy, my more practical, pragmatic side took charge. Teachers, nurses, and secretaries seemed to be the most popular jobs for women back then, so I opted for a career in the medical profession. It wasn’t until after becoming a wife and mother that the idea for actually sitting down and writing a book began to flourish, a fact I blame on the love of reading fostered years ago by a small town library. My favorite genre at the time was romance. I remember asking myself: How hard can it be to write a Harlequin romance? I soon found out when my manuscript was rejected with a form letter. About this time, Kathleen Woodiwiss burst on the scene and historical romancea became the hottest ticket in town. I tried, and eventually succeeded, in having nine historical romances published under the pseudonym of Elizabeth Turner. Eventually with our children grown, my husband and I decided to retire somewhere warm, somewhere we could play golf. The market for historicals had grown soft, so I resigned myself to thinking my writing days were behind me. Boy, was I wrong! Hearing the words “maybe it’s a dead body” while playing golf not only fired my imagination but turned it in an entirely different direction. The Bunco Babe Mysteries, a three book series, was the result. I’d come full circle and returned to my first love—mysteries. I thoroughly enjoyed writing about Kate McCall and her group of women friends who lived in a retirement community for ‘active’ adults and shared a love of the dice game, bunco. I’m having an equally good time with Piper Prescott who along with friends and acquaintances inhabit the fictional town of Brandywine Creek, Georgia. 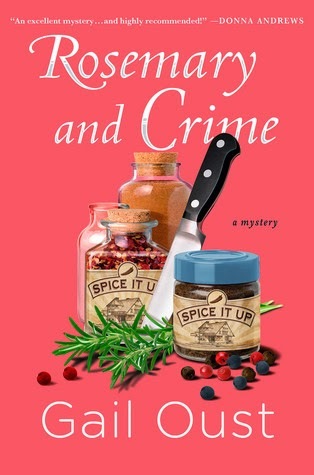 In Rosemary and Crime, the first in my new Spice Shop series, Piper, recently dumped in favor of a twenty-something in a short skirt, is about to embark on a career change of her own—from country club wife to business owner. Finding the body of the chef who agreed to do a cooking demo at the grand opening of Spice It Up! isn’t on Piper’s agenda. Not only are her fingerprints on what later turns out to be the murder weapon, but her alibi has disappeared without a trace. Piper, however, isn’t one to give up easily. She enlists the help of her BFF and sets out to prove her innocence. I can easily identify with a Piper, a woman who isn’t afraid to venture into unfamiliar territory. I did it when moving from the Midwest to the Deep South. I did it again when switching from romance to mystery. Like my son told me, life’s an adventure. I’m having a ball doing what I love best. This was the second book that I have read in this series and it just keeps getting better. Lauren is a great protagonist, she will do just about anything to keep her pets safe, she is also very good at solving murders. When some bling collars are being marketed for HotPets, it generates an interest in teacup dogs in the L.A. area. Lauren learns of a lot of teacup dogs that need rescued from a puppy mill is Missouri. When the dogs arrive they are accompanied by a worker from Missouri. When that worker is found murdered at HotRescues, Lauren has to figure out who the killer is so that her Airborn rescues can continue and she can clear her friends of the murder. In the meantime, she also has to figure out a mystery behind the adoption of some of the teacup dogs. This book kept my attention throughout. 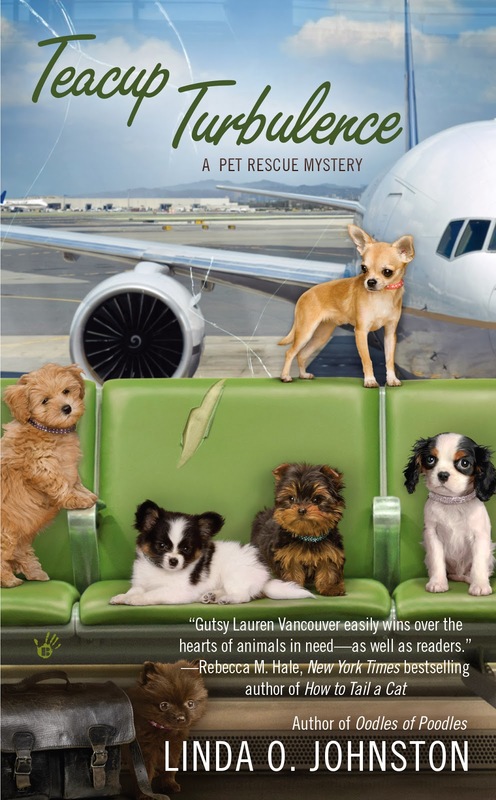 If you love a good mystery and are an animal lover, then this book is for you. Great job Linda, I can't wait for the next Pet Rescue Mystery, and I am going to try to read the ones that I have missed.